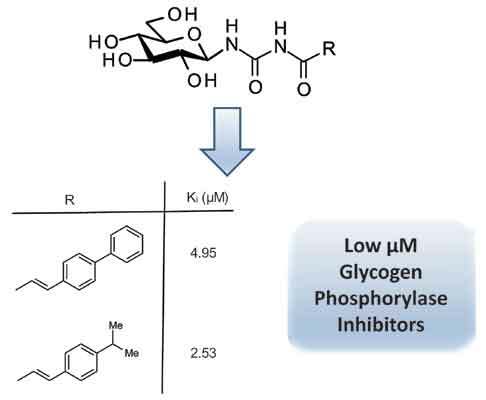 Glycogen phosphorylase (GP), a validated target for the development of anti-hyperglycaemic agents, has been targeted for the design of novel glycopyranosylamine inhibitors. Exploiting the two most potent inhibitors from our previous study of N-acyl-β-D-glucopyranosylamines (Parmenopoulou et al., Bioorg. Med. Chem. 2014, 22, 4810), we have extended the linking group to –NHCONHCO- between the glucose moiety and the aliphatic/aromatic substituent in the GP catalytic site β-cavity. The N-acyl-N´-(β-D-glucopyranosyl) urea inhibitors were synthesized and their efficiency assessed by biochemical methods, revealing inhibition constant values of 4.95 µM and 2.53 µM. Crystal structures of GP in complex with these inhibitors were determined and analyzed, providing data for further structure based design efforts. A novel Linear Response – Molecular Mechanics Coulomb Surface Area (LR-MM-CBSA) method has been developed which relates predicted and experimental binding free energies for a training set of N-acyl-N´-(β-D-glucopyranosyl) urea ligands with a correlation coefficient R2 of 0.89 and leave-one-out cross-validation (LOO-cv) Q2 statistic of 0.79. The method has significant applications to direct future lead optimization studies, where ligand entropy loss on binding is revealed as a key factor to be considered. ADMET property predictions revealed that apart from potential permeability issues, the synthesized N-acyl-N´-(β-D-glucopyranosyl) urea inhibitors have drug-like potential without any toxicity warnings. Glycogen phosphorylase, X-ray crystallography, Diabetes type 2, N-acyl-β-D-glucopyranosyl ureas, Binding free energy, Linear response methods. Centre for Materials Science, Division of Chemistry, University of Central Lancashire, Preston PR1 2HE, U.K., Department of Biochemistry and Biotechnology, University of Thessaly, Ploutonos 26, Larissa, Greece.